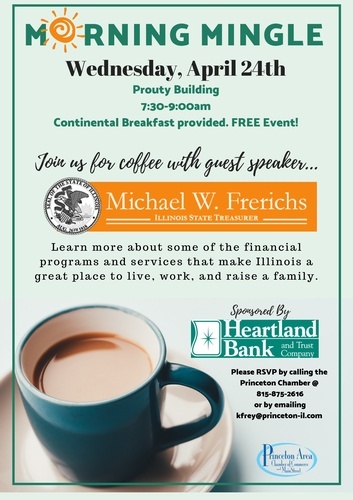 Morning Mingle...Join us for coffee with guest speaker, Illinois State Treasurer, Michael W Frerichs. Morning Mingles are open to all members of the Princeton Area Chamber of Commerce. Meetings include networking & a continental breakfast, followed by a presentation of the topics that are important to you! FREE Event...Open to the Public!